Gokyo Lake and Ngozumpa Glacier view from Gokyo _Ri 5365m. Gokyo Lakes and Gokyo Ri Trek is for the trekkers who desire to trek in high altitude to peer the splendid biggest mountain in the world and might take care of excessively cold weather. 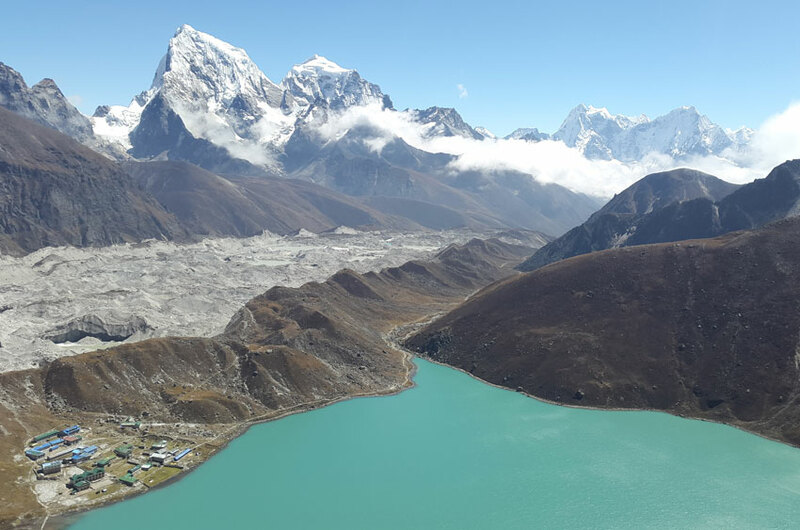 Exploring the stunning, turquoise Gokyo lakes, hiking Gokyo-Ri of Everest, extremely good views of planets most beautiful peaks are the special functions of this trek. This trek will provide you complete pleasure as you’ll get a chance to enjoy the actual journey with Halesi Treks teams members. 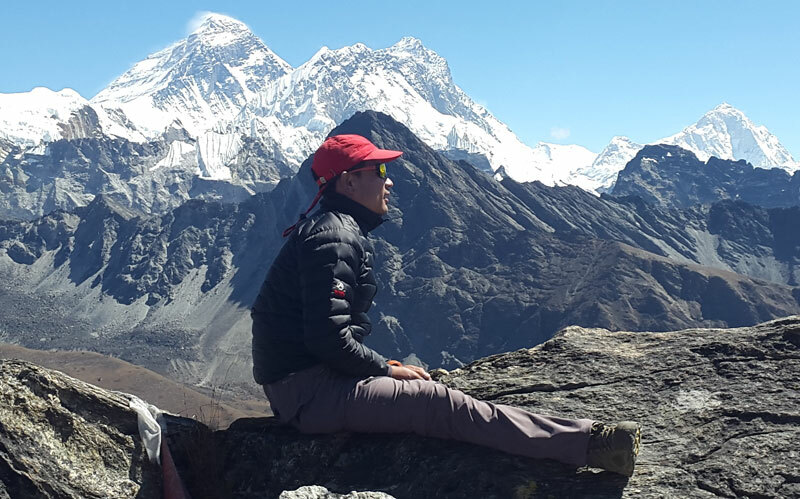 Gokyo Lakes and Gokyo Ri Trek is the alternative and exception of the traditional Everest Base Camp Trekking that offers the magnificent view of the mountain peaks and the Ngozumpa Glacier, the largest one in the Nepal Himalayas. you can experience the most popular mountains like Mt. Cho-Oyo (8201m), Mt. Everest (8848m), Mt. Lhotse (8501m), Mt. Makalu (8463m) etc. 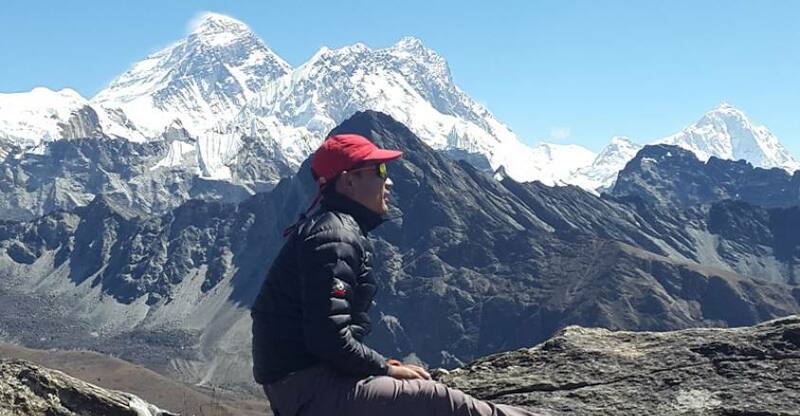 which are clearly visible in a panorama views from Gokyo Ri (5483m) This extraordinary trek is also worthy in a sense that it offers an ample opportunity to explore the amazing destination and its impressive sight, which is beyond human imagination. The most remarkable features of the Gokyo Lake Trekking is the view of tremendous ice ridge between Cho Oyu and Gyachung (7922m) located in Khumbu region. Gokyo valley is a magnificent place once a yak pasture situated near the Gokyo Lake with the view of Himalaya and you can encounter with its wild nature. Trek to Gokyo Ri which brings Everest, Cho Oyu, Makalu, Lhotse, Gokyo Lakes, and the Ngozumpa Glacier in one single frame. 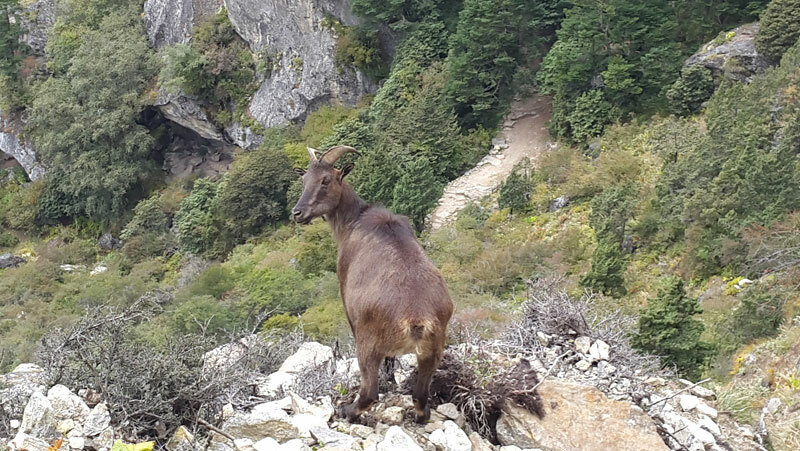 Experience amazing wildlife including the Musk Deer, Himalayan Tahr, Himalayan Monal and maybe even the Snow Leopard. Day 02: Fly from Kathmandu to Lukla and Trek to Phakding (2652) 3/4 hrs. Day 03: Trek from Phakding to Namche Bazaar (3,440) 5/6 hrs. Day 05: Trek from Namche Bazar to Dole-(4,110m) 5/6 hrs. Day 06: Trek from Dole to Machhermo ( 4470m.) 5 hrs. Day 07: Trek from Machhermo to Gokyo ( 4800m) 4/5 hrs. Day 08: Explore Gokyo Valley and Acclimatization. Day 09: Trek from Gokyo to Gokyo Ri ( 5365m) and trek back to Machhermo. 6/7 hrs. Day 10: Trek from Machhermo to Namche Bazaar( 3440m) 5 hrs. Day 11: Trek from Namche Bazaar to Lukla 6 hrs. Day 13: Transfer to international airport for your final flight departure. arrival in the Kathmandu airport you will be greeted by Halesi Treks representative and will be transferred to the Hotel. overnight at the Hotel. 30 minutes scenic flight to the small mountain airport Lukla, after reaching Lukla our guide will introduce with the porters, then start today’s trekking following mountainside on the left bank of the Dudh Koshi river, it is easy trekking. overnight night at the guesthouse. Trek starts in the morning after breakfast today is pleasant with few short uphills and downhill with multiple crossings over Dudh Koshi River and a magnificent view of Mt. 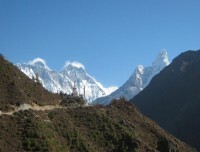 Thamserku (6,608m) from the Benkar village. We cross more bridges and reach entrance of Sagarmatha National Park at Monjo, where our trekking permits are checked in order to keep record of trekkers and local trekking staffs as well. A descend and a gradual walk brings us to Jorsale, the last village until Namche Bazaar. The walk is enjoyable through the river bed and we reach Hillary Suspension Bridge. Now, as we climb uphill towards Namche Bazaar, closer and magnificent sight of Kwangde Peak, its sister peaks, Kusum Kangaru, Mt. Everest, Lhotse, Tawache, and many other fabulous mountains are viewed closer, we stop at the Chautara here to admire the view. Finally, we reach the colorful village of Namche Bazaar, the main gateway of the Khumbu region. overnight at a guesthouse. This is really good for our acclimatization as it prevents any unforeseen altitude problems ahead on the trail as we go to higher altitudes on the trek, the Namche is tucked away between two ridges amidst the giant peaks of the Khumbu and has an abundance of lodges, tea shops, and souvenir shops. It is an ideal place to spend a rest day for acclimatization to the high altitude before heading off towards Gokyo Valley, For acclimatization, we walk up to Khumjung village through Everest view Hotel in Syangboche and see beautiful views of the Himalayas including Mt. Everest, Khumjung village is a brimming little town which is densely populated by the Sherpa community. At this village is an old monastery which we will visit as well, after this, we return to Namche for our overnight at guesthouse. We climb steeply out of Namche Bazar up to Kyangjuma Village from where we can enjoy outstanding views of Thamserku, Katenga, and Ama Dablam. A most exhausting ascent of the day is obviously to pass the Mong La, a very charming place perched on the spur of Mt. Khumbila. An ancient historical Chorten stands at the center of the settlement of Mong La. We stop at the top of Mong La to admire the grandstand views of the surrounding snow-capped mountains and valleys while we have our lunch. The most outstanding feature of the trail today is the abundance of plant and animal vegetation including wildflowers and Rhododendrons. Spotting wild lives like pheasants, mountain goats, and the elusive musk deer while on the way is not unusual. Through forests, some waterfalls, and bridges, overnight at guesthouse. we start our trek after having breakfast at lodge, and from Dole you will climb steadily along the side of the valley, where the small and thorny bushes give way to scrub juniper as the altitude increases, the trail passes many summer settlements, which are used when yaks are taken to these pastures to graze in the summer months, Ahead of you are excellent views of Cho Oyu, while back down the valley are the peaks of Kantega and Thamserku, overnight at guesthouse. After having breakfast at lodge, we head for the lakes at Gokyo, we follow a very scenic path to Pangka and then descend slightly, following one of the melt-water Rivers which flow down the west side of the Ngozumpa Glacier, we climb a steep rocky inclined into the valley by the side of the glacier, passing the first of the holy lakes, we soon arrive at the second lake, crossing the path which heads across the glacier to Cho La (5420m. 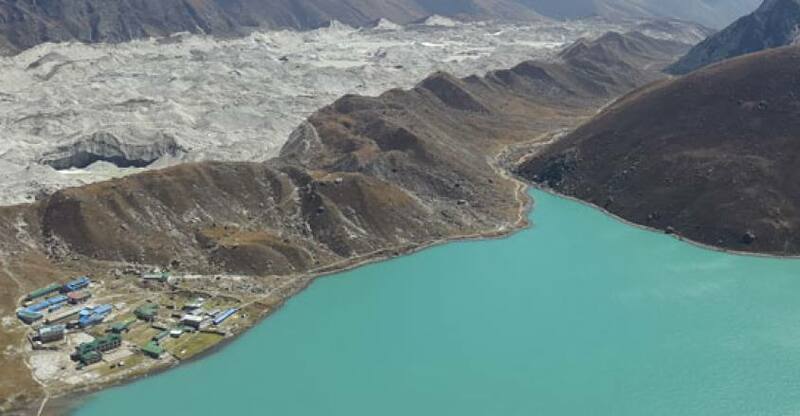 ), The third lake is known as Dudh Pokhari will appear and on its eastern shore is the settlement of Gokyo, walking by the side of the lake. overnight at guesthouse. Today is full day rest or an acclimatization day but we know we should not stay idle. If the weather is good, we grasp the opportunity to climb Gokyo RI today instead of next day to enjoy the scene from the best viewpoint of Everest Region. Or, as we know Gokyo is not only popular for its grand view from Gokyo Peak but also for the six lakes which it hosts. Certainly, we would not miss the chance to observe the fourth lake (Thonak Tsho) and fifth lake (Ngozuma Tsho). 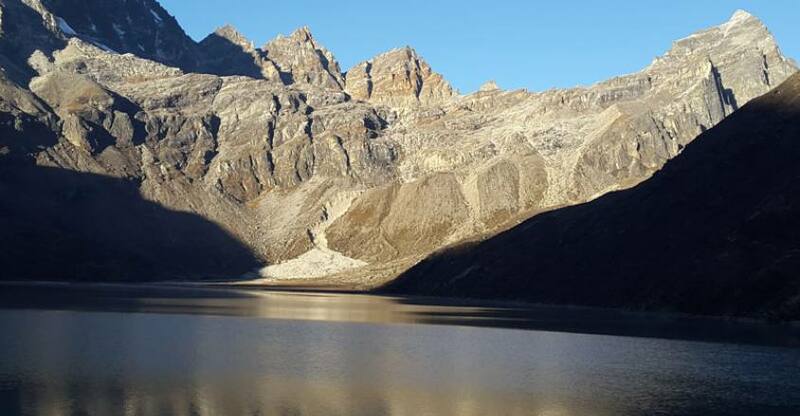 About 3 km north of Gokyo is the fourth lake with its high cliffs and peaks rising above it. The trail continues to the fifth lake. If interested, we climb on a hill at the edge of the Lakes to get outstanding views of Cho-Oyu, Gyachung Kang, Everest, Lhotse, Nuptse, and Makalu. Moved by the charm, we may even try to go the sixth lake too but depends upon our own interest and time. We will be back at Gokyo Village for overnight at guesthouse. Gokyo Ri looms above the village on the northern edge of the lake and we leave lodge just after first light, following a steep path up the hillside, as we climb, the summits of Everest, Lhotse and Makalu slowly come into sight and the view from the summit of Gokyo Ri itself, is one of the finest to be in the Everest region return to Gokyo. After lunch, we have short trekking to the village of Machhermo. overnight at guesthouse. we start our trek and the trail gently descends to Dole and then starts descending steeply to Photse Tenga (3650m.) 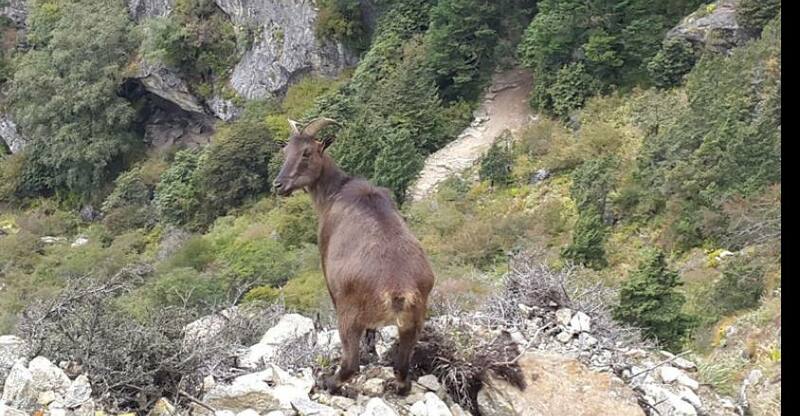 passing through rhododendron forests, then the path immediately ascends steeply to Mongla Danda (4000m.) and gently descends up to Kyanjoma (3500m.) following small ups and down to Namche Bazaar. overnight at guesthouse. today is the last day of our Gokyo trekking, the trekking is pleasant, except for few short uphill climbs and then down to the Bhote-Koshi River crossing it three times, the last uphill climb then will arrive Lukla. overnight at guesthouse. Flights to Kathmandu are usually scheduled for the morning because wind can create problem to fly the aircraft in the afternoon but sometimes the flight time can be delayed due to bad weather and other reason that are beyond our command. We fly back to Kathmandu after our long mountain journey. The early morning flight drops us at Kathmandu. You can rest and relax throughout the day in your hotel or hold around the city for shopping. At the evening Halesi Treks offers you the typical cultural farewell dinner at a real Nepalese food restaurant. overnight at hotel.